Ladies, do you have a go-to outfit or go-to formula you use when making last-minute wardrobe choices? Lately, my outfit of choice almost always involves a graphic tee and a pair of sneakers. 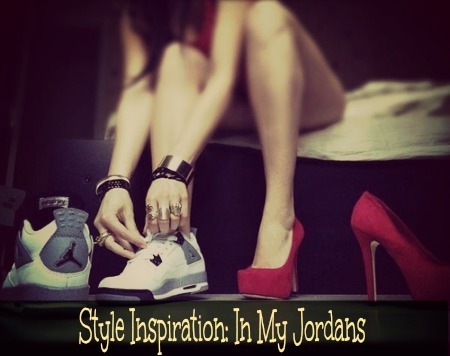 And since I've traded in my pumps for a little while for the comfort of my Jordans, I decided to share a few looks I created on Polyvore that illustrate the love I have for my graphic tee + Nike Air Jordan wardrobe formula. The studded biker jacket from Top Shop is too fab! Who would have thought Marilyn would look so good paired with camo print? I have to have that Michael Kors bag! Shout out to Charlotte, NC, by the way! This looks like me quite a few days of the week. Complete with the EOS Summer Fruit lip balm and all! ARE YOU A FAN OF TEES AND J'S? WHAT IS YOUR GO-TO OUTFIT FORMULA?